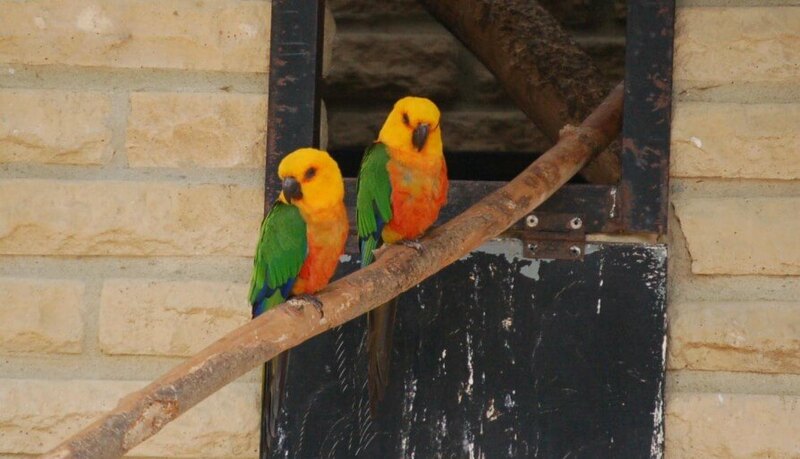 The Jenday Conure is a small member of the parrot family, and is very colourful. The head and upper breast are a golden yellow that blends into a reddish gold on the lower abdomen. Sometimes they will have an olive yellow breast. The wings, upper tail, and upper back are green moving into an orangish red on the lower back. The underside of the tail is black and the underside of the wings are an orangish red. The tip of the tail and the outer wing feathers are blue. The beak and the feet are black. A mature Jenday Conure reaches its full coloration at about two years of age. A younger bird will have duller coloration; a paler yellow head and neck with some greens, and a paler red on the breast. Habitat: The Jenday Conure is native to northeastern Brazil, and is usually seen around forest clearings, sometimes near coconut palms and edges of the rain forest. They are relatively common in the wild, and are one of the few species that has benefited from forest clearing. Lifespan: 30 to 40 years. Diet: In the wild, the Jenday Conure will eat seeds and nuts, as well as rice, corn, smashed cashews and fruits, including mango. Behaviour: They live in pairs or small groups of 10 to 15 birds. They love to play, and can be fairly destructive if not watched. They can also be rather noisy. Despite all this, they make a really fun pet and are very popular.